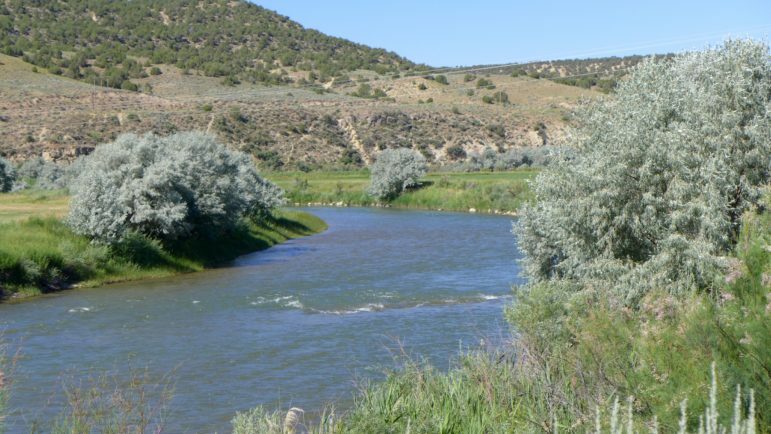 CRAIG — Three variations of a potential dam that could someday sit astride the main stem of the White River between Meeker and Rangely have been examined by the Rio Blanco Water Conservancy District in Rangely. 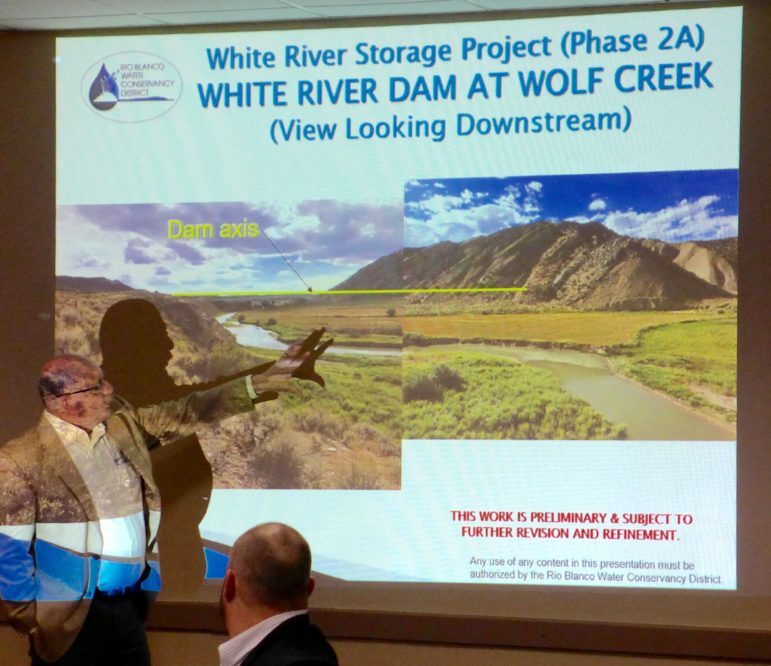 Last week in Craig, Steve Jamieson, a principal engineer and president at W.W. Wheeler and Associates, told the members of the Yampa, Green and White river basin roundtable that an 80-foot-tall dam built across the main stem of the White River at Wolf Creek could store 68,000 acre-feet of water. He said a 104-foot-tall dam across the river could store 138,000 acre-feet. And a 290-foot-tall dam across the valley floor could store 2.9 million acre-feet of water. Looking up the White River valley, with the Wolf Creek valley opening up to the left. The view is from Hwy 64. 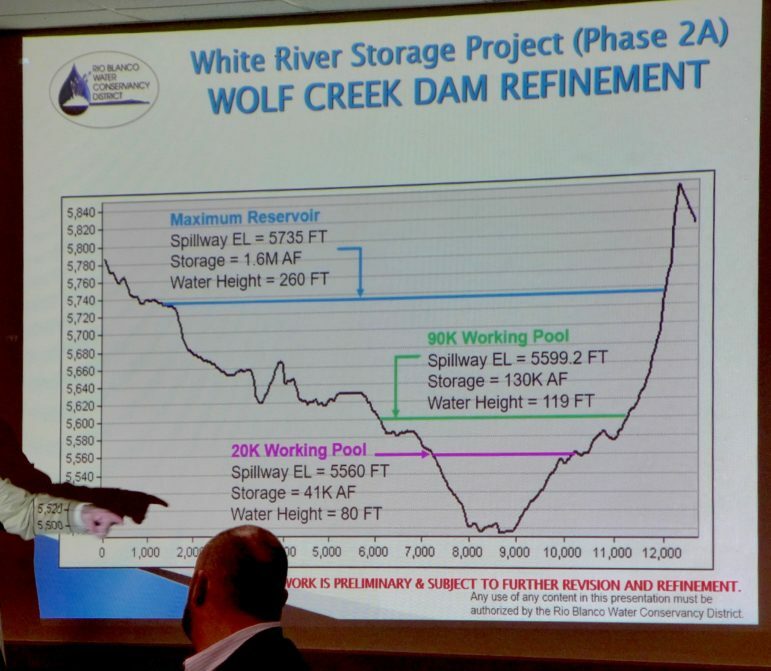 A slide being presented by Steve Jamieson of Wheeler a showing the range of dam and reservoir sizes that have been studied for the potential White River Dam on the main stem of the White River 23 miles east of Rangely. The dams range in size from 80-feet-tall to 290-feet-tall and could store between 68,000 AF to 2.9 MAF. 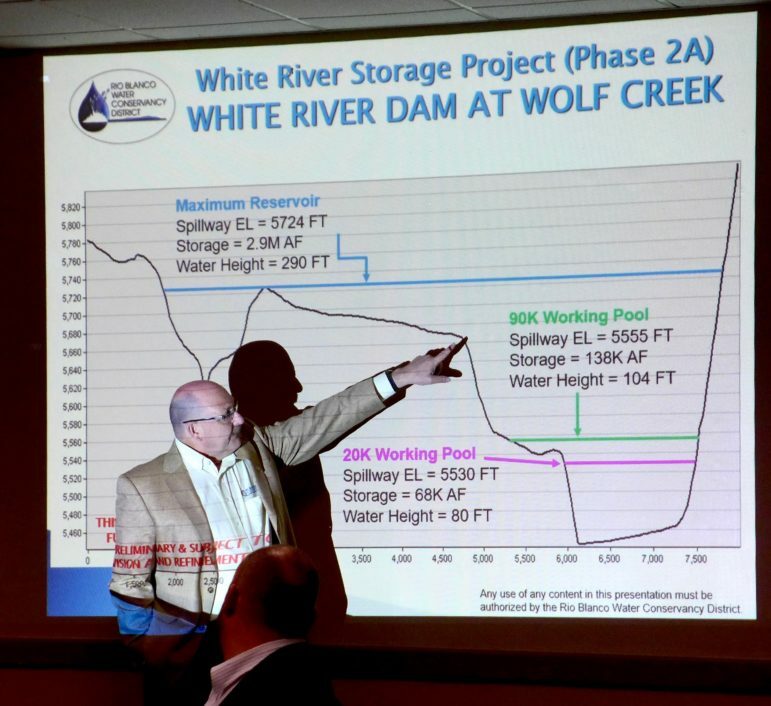 The dam sizes were studied as part of Phase 2A of the White River storage project, and the state has provided $500,000 in funding so far to study the project. Steve Jamieson, left, of Wheeler and Associates, and Brad McCloud, right, showing an illustration of where the axis of a 290-foot-tall dam across the White River would be. The big dam would require a 500-foot-wide spillway, which would mean relocating a section of Hwy 64. About 500,000 acre-feet of water a year runs down the lower White River each year, flowing through Meeker and Rangely and into Utah and the Green River. And between 1923 and 2014, the annual flow in the White River at the Utah line ranged from 200,000 to 1.2 million acre-feet, according to Wheeler and Associates. The potential White River Dam would be located 23 miles east of Rangely, along Highway 64. 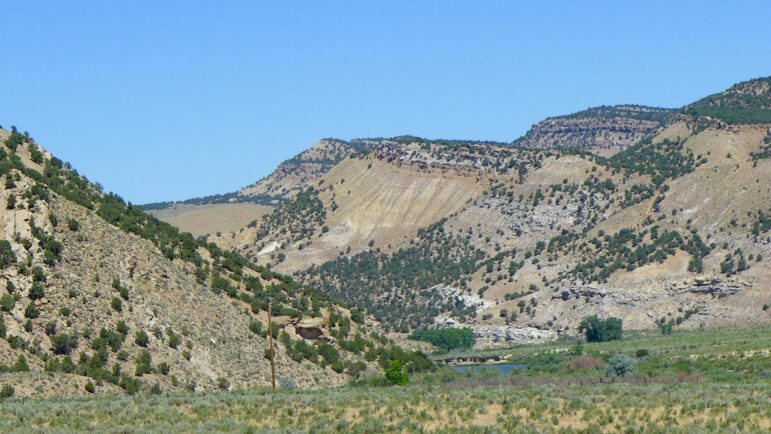 The existing Taylor Draw Dam, which forms Kenney Reservoir on the main stem of the White River, is six miles east of Rangely. That reservoir was built in 1984 to hold 13,800 acre-feet of water, but it’s gradually silting in, as was expected in a 1982 EIS done for the project. The surface area still “available for recreation,” or boating, is now less than 335 acres, down from 650 acres when the reservoir opened. The dam’s hydro plant, however, is still generating about $500,000 a year in electricity revenue for the Rio Blanco district in a run-of-river setup. A slide being presented by Steve Jamieson of Wheeler and Associates and Brad McCloud of EIS Solutions showing the range of dam and reservoir sizes that have been studied with state funding for the Wolf Creek drainage. The dams range in size from 80-feet-tall to 260-feet-tall and could store 41,000 AF to 1.6 MAF. The dam sizes were studied as part of Phase 2A of the White River storage project, and the state has provided $500,000 in funding so far to study the project. 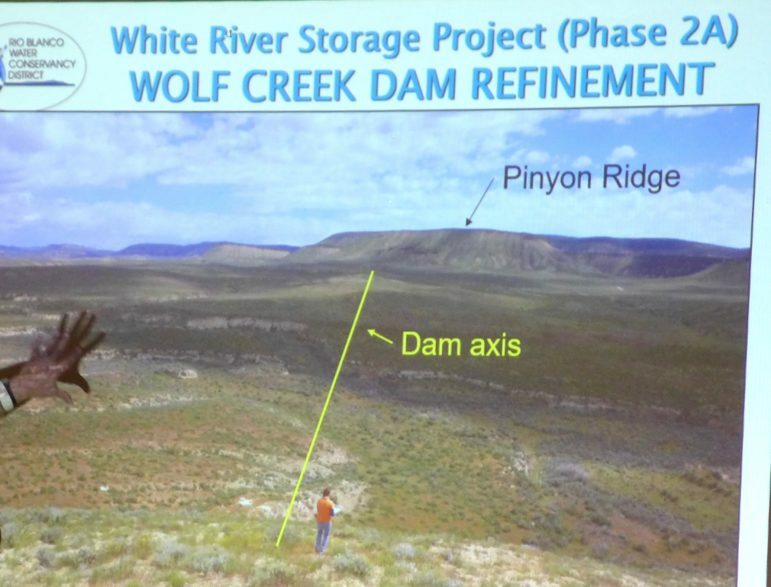 Jamieson also has been studying an off-channel dam in the Wolf Creek drainage, which is a broad, dry valley on the north side the river, just upstream of the proposed White River Dam site. The Wolf Creek Dam would be located 3,000 feet back from the river and 170 feet above it. An 80-foot-tall version of that dam could store 41,000 acre-feet of water, a 119-foot-tall dam could store 130,000 acre-feet, and a 260-foot-tall dam could store 1.6 million-acre feet, Jamieson said. However, the off-channel Wolf Creek Dam would require that water be pumped up from the river, at a high cost, or delivered via a 40-mile long canal or pipeline starting near Rio Blanco Lake — closer to Meeker than Rangely. “It’s going to be a very long and expensive canal,” Jamieson said. The pumping facility for a 90,000 acre-foot reservoir, which was studied in 2014, was estimated to cost $18.2 million build and up to $1.1 million a year to operate. Jamieson said Highway 64 would need to be moved to accommodate the biggest White River Dam option, which requires a 500-foot-wide spillway on one side of the river valley. The river itself would also have to be moved during construction. A slide presented by Steve Jamieson of Wheeler and Associates on May 9, 2018, showing the maximum inundation area of a 290-foot-tall dam on the main stem of the White River. Jamieson presented the slide at the May 9, 2018 meeting in Craig of the Yampa/White/Green basin roundtable. The basin roundtables operate under the auspices of the Colorado Water Conservation Board and review grants for water projects. The Colorado Water Conservation Board also wants to know what the maximum reservoir size is. 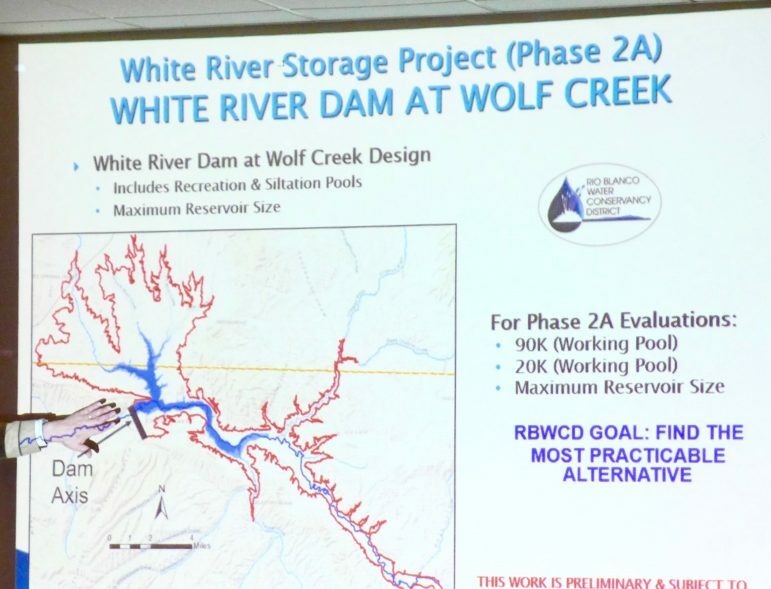 “Based on recent comments from some stakeholders, it may be beneficial to build the largest possible reservoir at Wolf Creek,” the scope of work for a 2017 grant from the board to the district states. One of those benefits could be helping the state avoid a compact call on the Colorado River. “Part of the Phase 2A study is to determine if the project may have the potential to provide Colorado compact curtailment insurance during periods of drought,” the 2017 grant application from the district said. 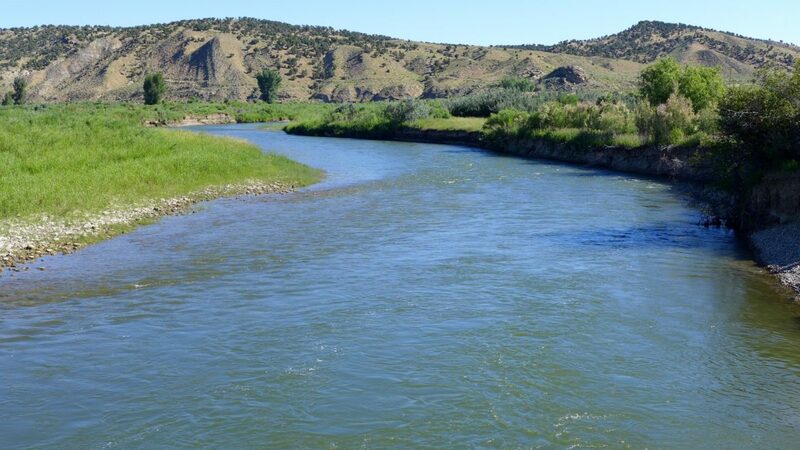 Since 2013, the district has received three grants totaling $500,000 from the Colorado Water Conservation Board for its White River project, and the potential benefit of compact compliance has been mentioned in all three grants. The White River near the vicinity of the Wolf Creek drainage. The river sends about 500,000 acre-feet of water a year across the state line into Utah, with flows ranging from 200,000 AF to 1.2 MAF a year. The White drains the western side of the Flat Top Mountains and flows through Meeker and Rangely. On Wednesday in Craig, Jamieson downplayed compact curtailment and focused on the district’s goal of creating a 20,000 or 90,000 acre-foot “working pool” of water inside larger potential reservoirs. For example, it would require a 138,000 acre-foot on-channel reservoir to establish a 90,000 acre-foot working pool for the district, after allowances for a recreation pool and a 24,000 acre-foot sedimentation pool — which would fill in over 50 years. To establish a need of the stored water, Jamieson cited a 2014 study showing demand in the basin at 91,000 acre-feet in 2065. That’s on the high end, though. The low-end need in 2065 was 16,600 acre-feet. The district filed in water court in 2014 for a 90,000-acre-foot storage right at both the on-channel and off-channel locations. She questioned the district’s use of the highest estimates for such potential uses as oil shale production and flows for endangered fish. The water attorney for the district, Ed Olszewski, responded to Light in August. As Jamieson wrapped up his presentation, he said the Rio Blanco district plans to “initiate project permitting” in 2019. Aspen Journalism is covering water and rivers in collaboration with The Aspen Times and the Glenwood Springs Post Independent. The Times and the Post Independent published this story on Monday, May 14, 2018.